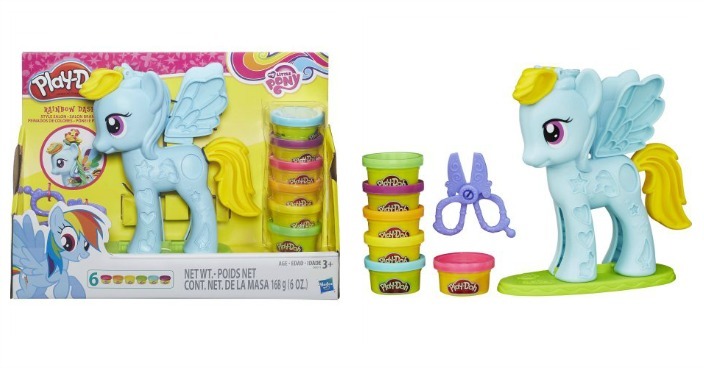 Play-Doh My Little Pony Rainbow Dash Style Salon Playset Just $7.78! Down From $15! You are here: Home / Great Deals / Play-Doh My Little Pony Rainbow Dash Style Salon Playset Just $7.78! Down From $15! Right now you can get this Play-Doh My Little Pony Rainbow Dash Style Salon Playset for just $7.78 (Reg. $15) at Walmart! What’s more fun than a magical, fashionable pony? A pony you can “grow” hair for! This Rainbow Dash Style Salon playset includes a pony extruder that looks like Rainbow Dash and six colors of Play-Doh modeling compound. You can make a rainbow braid for her and cut it off with the scissors and make all kinds of fun decorations for her! When you’ve got the Rainbow Dash Style Salon playset, the only limit to the creativity is your imagination! Play-Doh, My Little Pony and all related characters are trademarks of Hasbro.